Walls are what they are—big, dull dividers. With a few applications of conductive paint and some electronics, however, walls can become smart infrastructure that sense human touch, and detect things like gestures and when appliances are used. Researchers at Carnegie Mellon University and Disney Research found that they could transform dumb walls into smart walls at relatively low cost—about $20 per square meter —using simple tools and techniques, such as a paint roller. The electrode wall can operate in two modes—capacitive sensing and electromagnetic (EM) sensing. 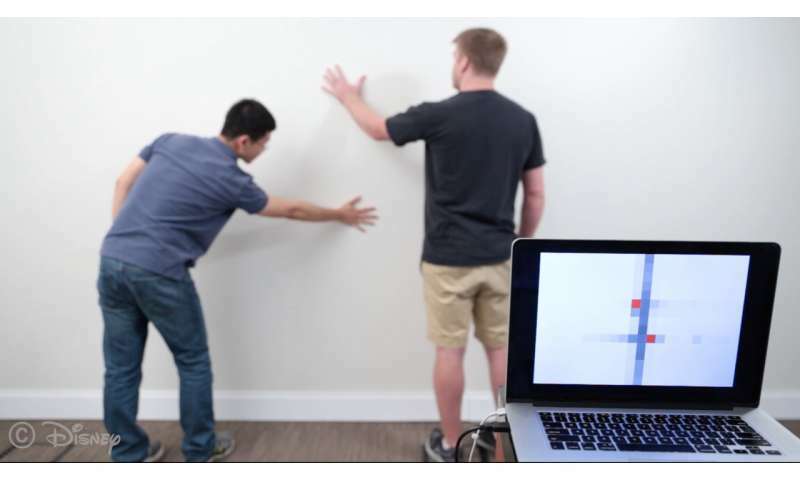 In capacitive sensing, the wall functions like any other capacitive touchpad: when a person touches the wall, the touch distorts the wall's electrostatic field at that point. In EM sensing mode, the electrode can detect the distinctive electromagnetic signatures of electrical or electronic devices, enabling the system to identify the devices and their locations. This would be most useful in conjunction with some sort of display that goes on at the same time. It wouldn't have to be very bright to be quite useful for maintenance. If on the other hand it could be made like some sort of electronic ink it would use reflected light be could be very low energy. "They then finished the wall with a top coat of standard latex paint to improve durability and hide the electrodes." Better make sure you never forget and accidentally drill a hole in that wall.